It was just a play on words, of course, when the Florida newspapers said that Sam Querrey had “let’’ Ryan Sweeting win Wednesday. It did involve a disputed let-call. But it’s a bad choice of words for Querrey. Sweeting said it showed “how good of a guy’’ Querrey is. The Fort Lauderdale paper called it a classy move on Querrey’s part. Or was this just another example of Querrey’s fatal flaw. I’m going with the second choice. With his own yelling, and with the crowd cheering his victory over Querrey, Sweeting didn’t hear the chair umpire calling a let. Sweeting needed to play the point over. I’m not getting this at all. He heard the let, and conceded the point anyway? Is that really sportsmanship? If Querrey had stayed alive on a bad call, then yes, that would be good sportsmanship to concede the point. But Querrey thought it was the right call. He knew it was. If he thought he was unfairly benefitting from bad calls earlier in the match, and didn’t like that, then he should have conceded those points at the time. It sounds as if he just didn’t feel like playing any more. And if you were Sweeting, would you have been insulted that someone let you win like that? 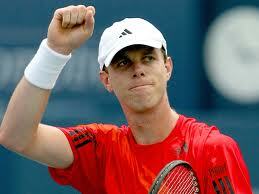 Sam Querrey drives me crazy. There is no way that this guy is who he is. Tall, strong, fast, and able to hit all shots. Why doesn’t he care? Why the heck doesn’t he care? Querrey, seeded No. 18 and one of the leaders of the next generation of American tennis, folded up again in a major. He does it all the time. He lost Monday in the first round of the Australian Open, 5-7, 6-2, 3-6, 6-1, 8-6 to Lukasz Kubot. Querrey seemed to be picking at his fingernails on match point.